Editor’s note: The following column is about Cao Dewang (or Cho Tak Wong), a well-known entrepreneur in the glass industry and a top philanthropist in China. About two months ago, Cao revealed an investment plan in the United States totaling about $1 billion, which is expected to create thousands of jobs. A recent interview with Cao, where he explained why he made the decision, led to intense discussion in China about the country’s economy and the obstacles to doing business in China. The following column by finance columnist Dao Feng was among the most popular on the topic. A year ago, Chinese real estate tycoon Li Ka-shing massively sold his real estate holdings in mainland China and “escaped” to the UK. Back then, an article titled, “Don’t Let Li Ka-shing Run,” widely circulated online. But maybe because of Li’s Hong Kong citizenship and not being a mainlander, state media refrained from taking his retreat very seriously. 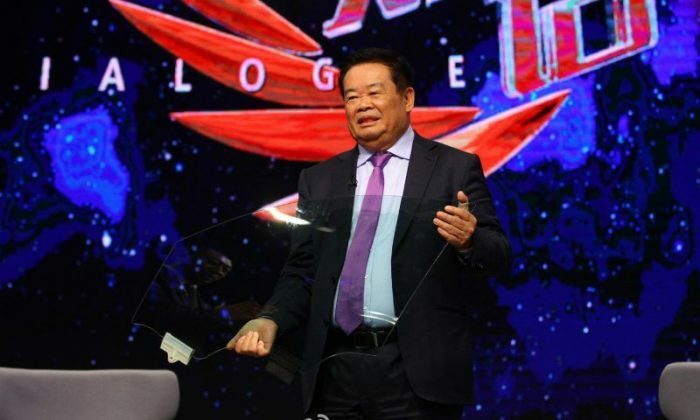 However, a year later, Cao Dewang, chairman of Fuyao Glass Industry Group, the second largest manufacturer of auto glass in the world, is leaving for the United States to build factories and plans to invest $1 billion. This time Chinese media has responded in an uproar. Why is Cao, the king of glass and China’s No. 1 benefactor, going to the United States? The reason is the high cost of doing business in China. According to Cao, even though wages are lower in China, land, taxation, energy, logistics, and other costs are much higher in China than in the United States. As a key figure of China’s manufacturing industry, Cao’s economic evaluation, though it makes China lose face, demonstrates the thinking of a true entrepreneur. Capital naturally chases the highest return, and if this is true, Cao is voting against China’s poor real economy with his feet. Now the Chinese media is demanding that Cao stay put. But even if Cao Dewang stays, will Zong Qinghou, Dong Mingzhu and other entrepreneurs do so? We need to seriously consider how to really keep these Chinese manufacturers and support the development of the real economy in action. To create the “slow bull” market, the China Securities Regulatory Commission (CSRC) has recently cracked down hard on “monster stocks,” a term referring to those with unreasonably spiking or plummeting prices, even at the cost of serious financial market losses. Apparently, Liu Shiyu, Chairman of CSRC, understands politics very well. In response to the call from the top to transform the economy from virtual to real, CSRC has been determined to deleverage, squeeze the bubble, and guard against risk. It seems they now realize that the revival of China’s real economy cannot be further delayed. During the recent Central Economic Conference, high-level officials set the tone, with the main focus being reducing bubbles. According to this rationale, the stock market will experience short-term adjustment and pains, but this is said to serve as the basis of the 2017 slow and steady bull market. Also predicted, however, is a long-term capital scarcity. Why doesn’t China’s real economy make money? Because of insufficient demand. Why is the demand insufficient? Because people have no money to spend. Why don’t people have money? Their money was taken away by real estate speculation and various financial scams. Moreover, many years of government stimulus spending created asset bubbles, have made the rich become richer and the poor become poorer. The growth of M2 mostly benefits high-income groups, but their need to consume will not grow as much due to diminishing marginal utility. Since the recession hit the real economy beginning in 2014, a flood of hot money inflated bubble after bubble. In early 2014, the bond market rallied, followed by the stock market in the second half of that year, the real estate market in 2015, then the commodity market in 2016. In addition, use of the Internet has led to an acceleration and bubble in the virtual economy during recent years. Many companies raised billions of yuan just by telling a good story via powerpoint presentations. If we want to go back to the real economy, we need to come up with courage and action, otherwise the whole business community will run away. Cao Dewang’s story also exposes a major sore spot in China’s economic recovery plan: high taxation. China has the world’s most government investment projects. It therefore has to impose the highest taxes in order to maintain itself. Moreover, when local governments’ land sales revenue comes to an end, tax pressure will become even higher. Right now, tax cuts sound like just fairy tales! For a long time, China’s per capita income growth has been lower than the country’s GDP. GDP growth has been lower than tax growth. Burdens increasing for enterprises is an indisputable fact, and in the long run, capital escape is inevitable. The solution lies in smaller government, including the reduction of project approval processes, large-scale dismissal of the civil service staff, reduction of all kinds of ineffective investment, and substantial tax reductions. The outcome would be that the growth of people’s income will surpass that of GDP, and the growth of taxes will be less than GDP. This is an abridged translation of a Chinese article posted on the author’s personal blog at Sina. Dao Feng is a well-known Internet blogger and stock analyst. Writing pseudonymously, Dao Feng produces a high volume of articles analyzing China’s stock market and economic issues, and is one of China’s most influential financial bloggers, registering millions of readers monthly.